Please fill out the form below with any comments or questions and our office staff will get back in touch with you soon! Thanks! Four Convenient Locations - Click Here! Why do we at CCWC sell custom made orthotics? As we stand on our feet over time, our arches start to break down. Other reasons are flat feet, being overweight, and pregnancy. 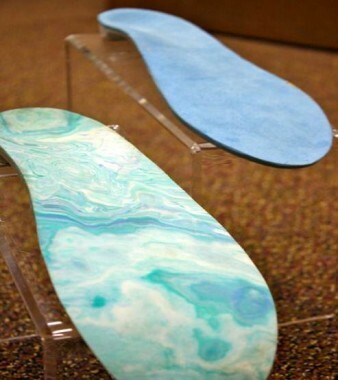 Custom orthotics help to realign your feet, help your posture, and allow your treatments to hold and last longer. We see the need frequently in everyone from young adults to the elderly. When you come into our office, one of our four Doctors will analyze your posture. While doing this, your foot posture is also analyzed. If it is determined that orthotics will help you, we will cast your feet in a non weight-bearing posture to get your neutral, normal foot posture. We then send the cast off to our orthotic company, and in three weeks your custom orthotics are back and are fitted into your shoes. It is amazing to see the changes in patients if this is the cause of their problem. If you are wondering if you might need orthotics, you can do a simple home test. Stand without shoes on and have another person look at your feet from behind you. If your achilles tendon bows inward or outward, you should come in for an evaluation.